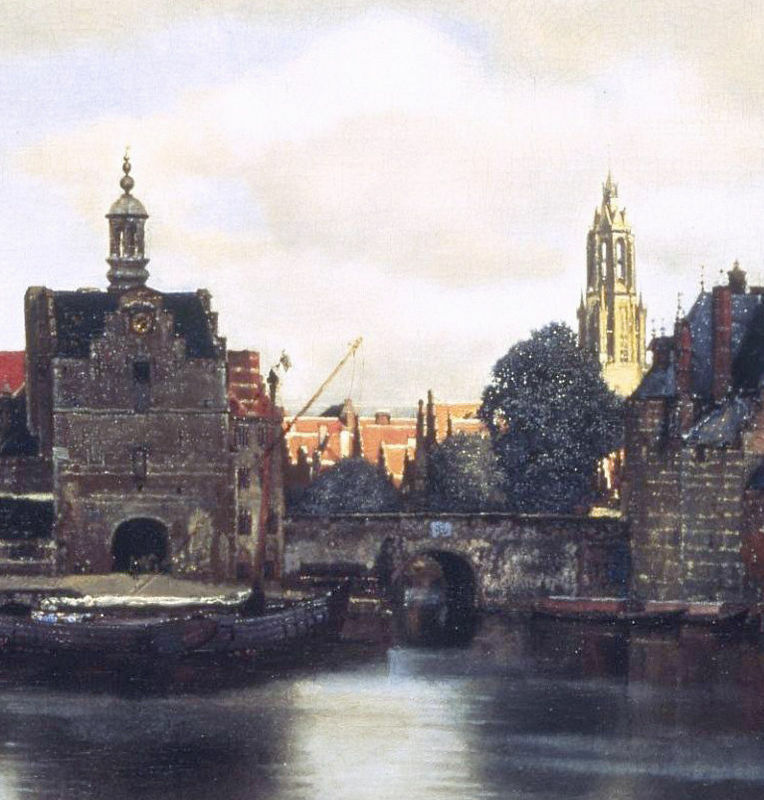 View of Delft is a painting of Vermeer's hometown and is among his most valued works. It is even regarded by some as the most distinguished cityscape of 17th-century Dutch art. 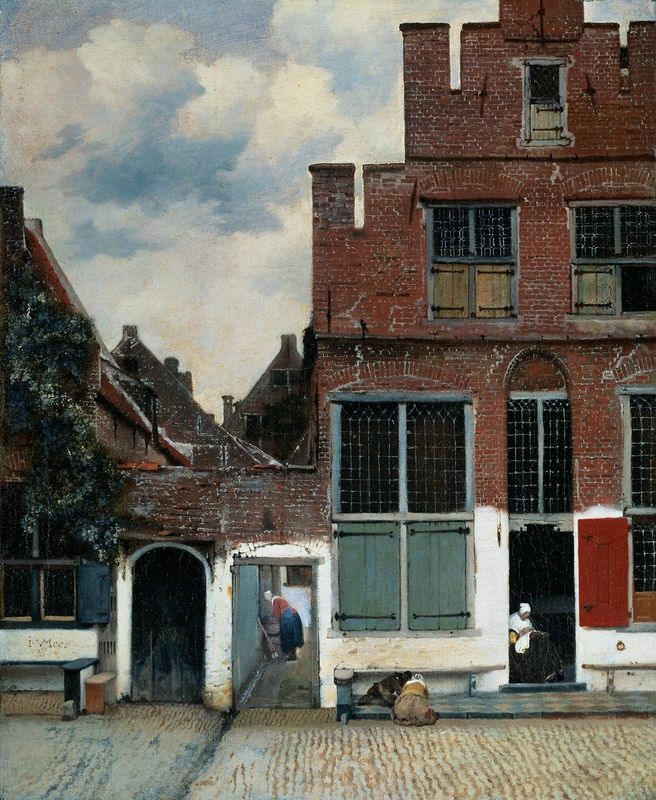 Vermeer produced this canvas at a time when cityscapes were not particularly common and it is one of three snapshots of Delft that he painted, along with The Little Street and the lost painting House Standing in Delft. In View of Delft Vermeer paints the city from a southeasterly direction and in the foreground we can see the Schie Canal which runs through the city. The sky is brimming with clouds and looming dark clouds cast a shadow on the water and buildings. The sunshine breaking through highlights the roofs and this adds depth to the painting. View of Delft reflects Vermeer's concept of beauty and the prominent churches could be a subtle reinforcement of Christian morals and values of this time. It could also be that by painting the Old Church in shadow and the New Church in sunlight that he was portraying the city's spiritual growth. This is a very realistic image of Vermeer's birthplace and it almost transports the viewer to the scene as he observed it. His use of lighting is objective and has a photographic quality to it, demonstrating the artist's talent. The detailing in this image is precise and we can see ripples on the water and passers-by chatting. Vermeer's figures represent Dutch society at this time and he inserts a mother with a child, men and two peasant women all wearing traditional clothing. His figures also represent his sense of idealism of Delft community and his aesthetically pleasing depiction of the city at dawn conveys a feeling of harmony. This realistic portrayal was somewhat rare and together with The Little Street, View of Delft is the only work that Vermeer executed outdoors. Vermeer relished creating realistic images from the most mundane moments of daily life and due to the fact that Delft was under Spanish rule, artistic content in the city centered on images of domesticity and the local surroundings. Also, most paintings were created in the contexts of Christian morals and values which is particularly obvious in View of Delft. Vermeer prided himself on conveying the beauty of everyday scenes and Dutch society liked images of domesticity that instilled a form of homogeny. Vermeer was raised Protestant and Protestant Dutch society held the natural aspects of life in high esteem and this provided inspiration for many of the artist's works. View of Delft is a prime example of Vermeer's inventiveness. He uses a variety of methods to capture the true essence of this scene and was praised for his unique dynamics in compositional techniques in particular. Vermeer adds a feeling of depth and distance to this piece by placing the clouds prominently in the front of the canvas and then showing them diminishing into the background. Perspective is also achieved in the bottom and top sections to the right which are situated nearer to the viewer. The eye is drawn to the docking ground which starts out below eye level and directs the eye to the boat at the turreted gate. The viewer then looks to the left side of the canvas which lies farther behind the first section. The figures are also positioned upon different planes as the two ladies at the forefront are larger and closer than the other subjects. The winding water path also works to direct the viewer's focus into its centre. By elongating the view of the city, Vermeer's work flows well. The artist depicts the roughness of stone perfectly by mixing sand into the paint, creating an uneven surface and grainy texture, resulting in a three-dimensional effect. Vermeer uses the camera obscura in this piece, a great contraption for allowing a painter to focus on each aspect of a scene. 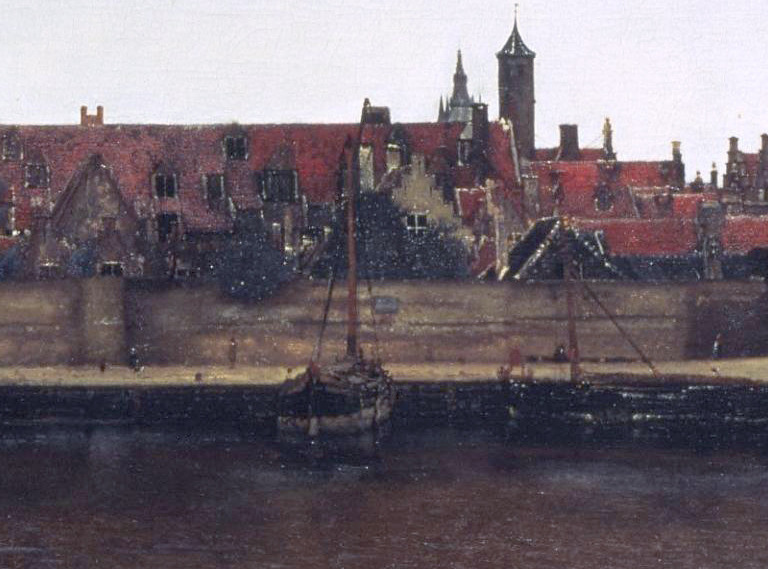 In View of Delft, Vermeer would have picked up on detailing that would not have been visible to the naked eye. 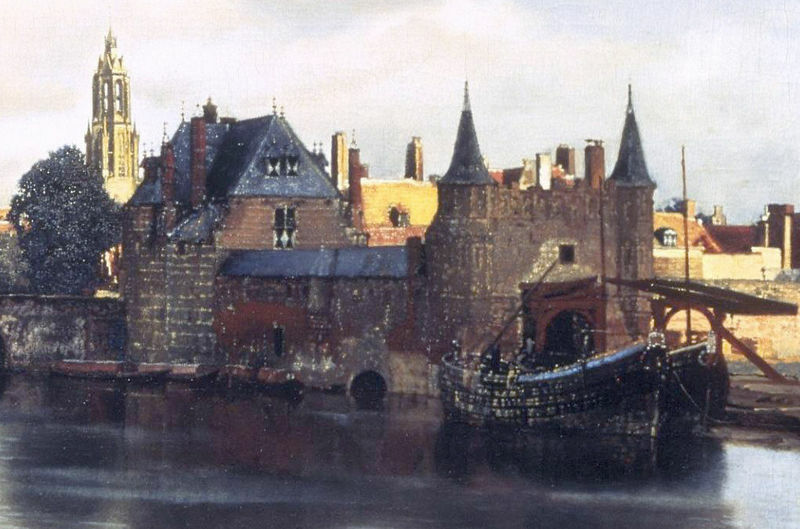 Vermeer uses bold colors for the roof buildings and sunlit areas to create a deeper perspective. His use of the much-loved ultramarine can be detected in the boat and trees and the roof top to the right. The sky is painted in mild brown and yellow ochres to separate the clouds and sunlight. Thin strokes of brown-grey and grey-blue paint show reflection on the water and these are softened with a brush. It appears that camera obscura has been used to depict shimmering in the water. The camera would serves to emphasize the shine so that each ripple could be depicted. Vermeer's use of lighting is finely painted to produce a natural sense of depth. There are bright patches in the background and to the right which identify the light source and the position of the clouds in relation to the sun. The detailing in this piece allows the viewer to imagine the breeze blowing through this scene and so the overall climate is also conveyed. The placing if light and shadow in this image also helps to define the city's distance and depth and there appear to be four horizontal planes. 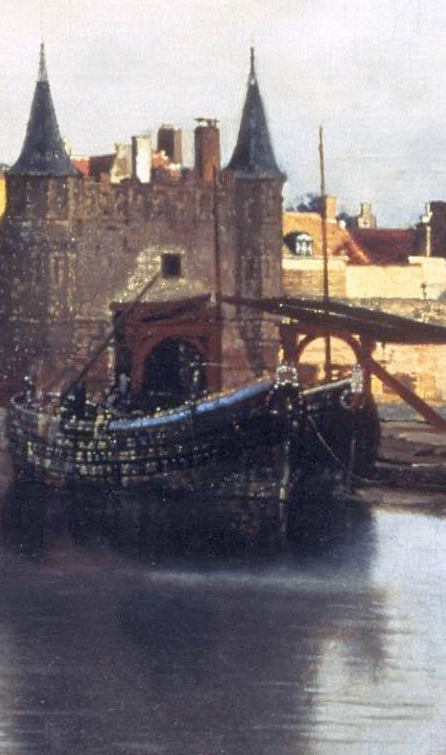 Using shadow and light techniques, Vermeer blends the lines and this is obvious in the tall buildings which come out of the deep shadows and into the light. The water also serves to blend the image by reflecting the nearby buildings and creating a natural binder for the planes. View of Delft was created with a great deal of layering and fluid brushstrokes used in horizontal motion. Vermeer painted the sky with more agitated strokes and the looming clouds impose on the view of the sky. 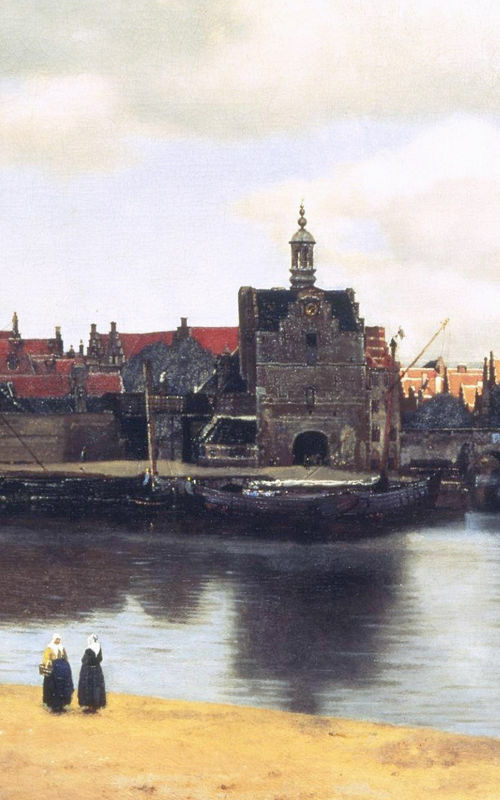 "Vermeer's view encompasses both the visible and the unseen heart of Delft". 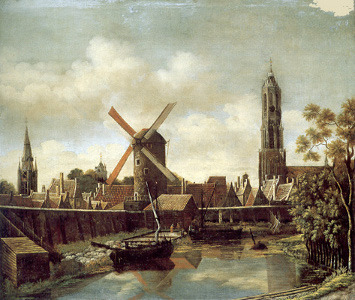 In his book "Vermeer", Matin Bailey points out that View of Delft has always been regarded as one of his masterpieces. In the mid-nineteenth century this work inspired the French critic Théophile Thoré to rediscover Vermeer. "Vermeer's View Delft is probably the most memorable cityscape in western art. Though not an interior scene, as most works by Vermeer are, the painting draws us into his mental and social world: into his artistic vision and into his city. What we see seems almost too obvious, too plainly descriptive, too perfectly observed to require comment or analysis: the city of Delft appears before us under the partial clouds characteristic of the North Sea climate, a palpable grouping of brick, mortar, and clay structures seen across the broad Schie canal. It is all there, still nameable today: the Schiedam gate at left, the Rotterdam gate with its twinned turrets at right, the tower of the Nieuwe Kerk, or New Church, picked out in the brightest sunlight, the diminutive tower of the Oude Kerk, or Old Church, just breaking the long roofline at left. The scene's varied light effects look so natural —deep shadow and bright patches, pinpoint highlights and watery reflections—that the eye ignores what the mind knows: that this light is high artifice, that it is a work of painting." At a 1696 auction of Dissius's twenty-one Vermeer paintings, View of Delft was the most expensive, fetching 200 guilders. 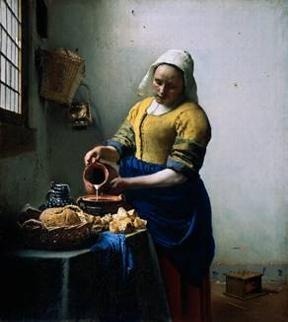 It was bought by the Mauritshuis in 1822 for 2,900 guilders, a purchase thought to have been instigated by the Dutch King, Willem I.
Vermeer was a realist painter who focused a great deal on chiaroscuro and became a master in using this technique. He delighted in the technicalities of the camera obscura and was an avid fan of using various lens and glass contraptions to discover new forms of capturing light in different contexts. 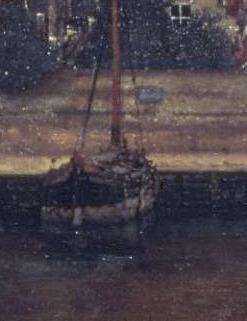 The artist's use of this technique is particularly obvious and successful in View of Delft. Although Vermeer held nothing original in his artistic interpretation and subject matter, he was extremely skilled in creating superb pieces of art. 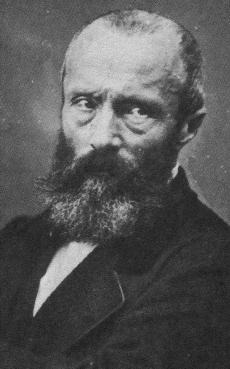 He didn't create many self portraits, focusing instead on objects taking the viewer to image as he saw it. 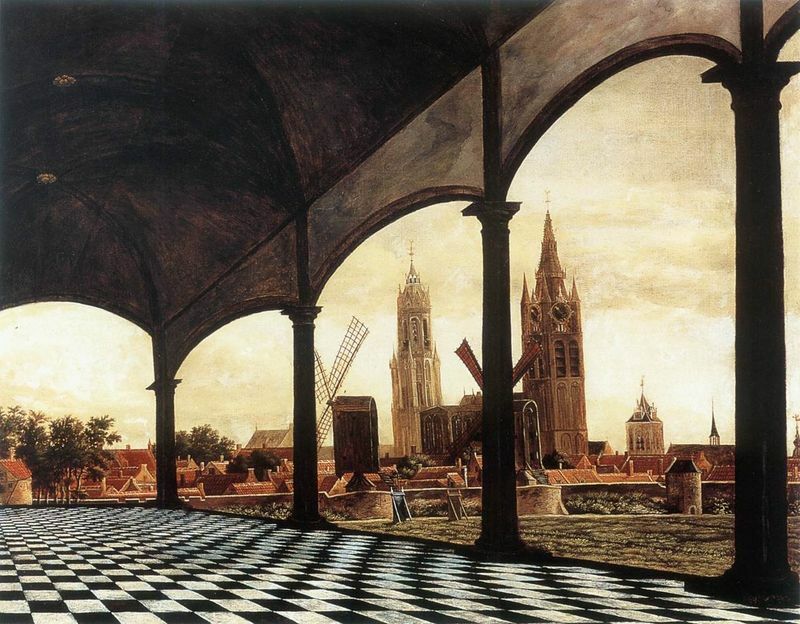 His work allows the viewer to be more active in the viewing process and this is clearly demonstrated in View of delft. Vermeer does not create a specific narrative in his works like his contemporaries but rather focuses on the moment itself and the rest of the story is created by the viewer. Vermeer was a master in aspects of space and dimension and his ability to effectively use the color palette with all its limitations demonstrates his talent in creating scenes of photographic quality. In View of Delft his realistic portrayal was rare and Vermeer was praised for his unique dynamics in its compositional techniques. Dutch Baroque has become the most noted era in art and it was the most lavish style in the history of Europe's figurative arts. Artists were able to freely choose their subject matter and how they wanted to express it and this resulted in artist excelling in creating new art styles and techniques. Paintings produced during this time were large and dramatic works that used diagonal compositions and special effects to make a lasting impression on the viewer. Baroque art came into play at a time when the foundations of capitalism were being laid by the world's growing economies and art was expanding in new and exciting directions. New national schools were opening across Europe but there was already a dominate style, spearheaded by great masters, such as Caravaggio, Poussin, Bernini and Rubens who provided inspiration for many emerging artists. To read more about Vermeer and his works please refer to the recommended reading list below.